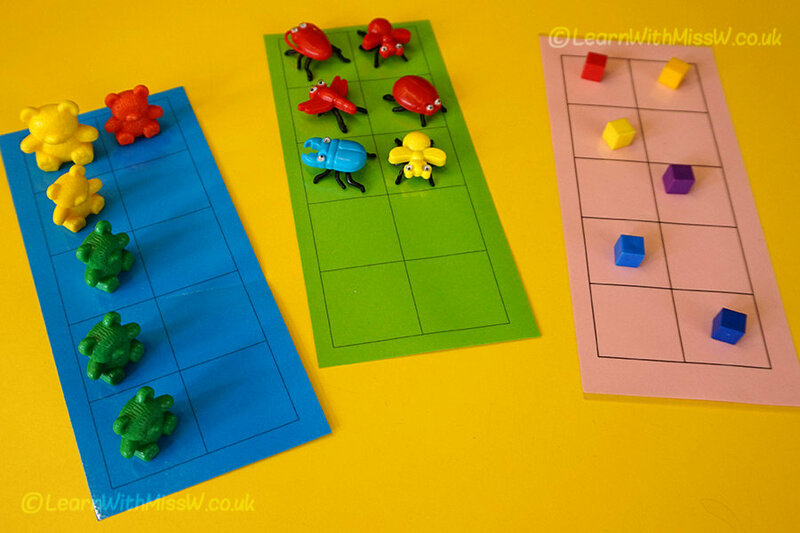 I use tens frames as one of my maths teaching group activities to help children recognise and learn about the quantity of each number, not just the written digit. Working with up to 6 children, each with their own tens frame, we pick a number and they lay out the correct number of cubes or objects. The real learning happens as we talk about the different ways to represent each number and how they are in fact the same quantity. In this example, we are making 6. Some children will make their number 6 like the bears, by filling one column of the tens frame then adding 1, others will have filled from the bottom or the top in a paired arrangement like the bugs. Others may make patterns or put out the objects more randomly. Children are encouraged to spot who has arranged their number in either the same or a different configuration to them, while still realising that everyone has made 6, even if the arrangement looks a bit different. If I then ask children to change the number to 5, it is interesting to see who can figure out they only need to remove 1 and who clears the board and starts counting from 1 again. The conversations and reasoning around what the children are doing is really important, and they can learn from each others’ explanations.